Hi loves! I recently picked up these Forever Young by Jean Pierre makeup removing cleansing wipes at Ardene. The adorable packaging really caught my eye. These wipes are really affordable at 3 packs for $10.00. I wasn't sure what to expect quality wise, since makeup remover wipes are usually around $10.00 a pack at the drugstore. I am pleased to say that these wipes really impressed me! 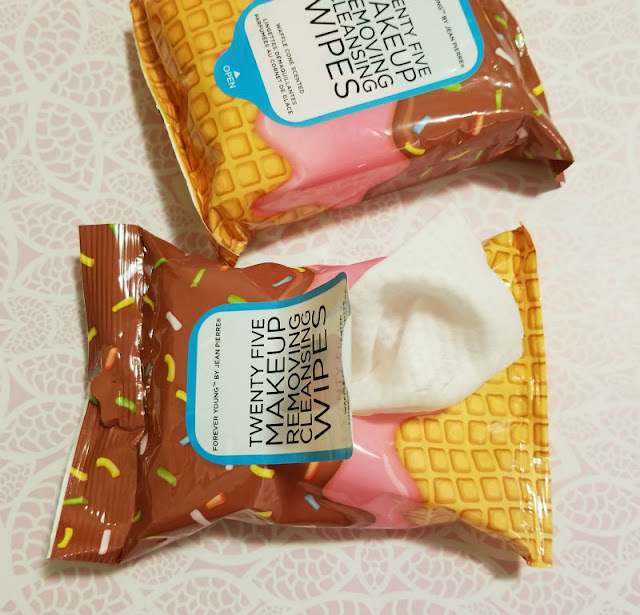 The wipes are very soft, and the waffle cone scent is so yummy. They do a great job at removing my makeup up. My skin is left feeling fresh and smooth. The Forever Young by Jean Pierre Makeup Removing Cleansing Wipes will definitely be my go-to makeup remover wipes from now on. They are cruelty free, and also come in coconut scent and unscented. Hi i got these for christmas and it’s all i have been using on my face since beside water and i’m in hives broken out my skin is so irritated and It has moved to my whole face please just don’t buy these !!!!!!! !